Where I share my creativity, discuss styles, and hijabiz can give me ideas and inspiration. Infinity scarves are the circular tube like scarves. I first purchased one from AVON 6 years ago and wore it pinned up as a hijab and I remember going to a store and people were asking if it was my hair. Seriously!!! Anyways, I still have that one and my father in law bought me 3 from Peru. These scarves are so much fun because you can play around with it just like a hijab but you can also turn these scarves into shrugs!!! So in my video I show you how you can make one by cutting up your shirt. I will insha’ALlah show you how to make one from scratch. PS: So I didn’t realize that I was just recording the lower half of my face. My son sort of took off with my tripod and now I don’t know where it is…although I have a good idea what might have happened to it. Also, my son wanted to help me out with my voice over, so he does make a voice appearance in the video for a while and he’s LOUD!!! And lastly, it’s hot here and I had a fan on in the background and for that reason I had to voice over because the loudness of the fan took over my voice. I just got back from another amazing trip…I already miss my family and friends, but I have much to look forward too!!! Like my family coming to NY in 3 weeks Insha’Allah…we are going to have a blast together making this part two of my summer fun!!! BTW, Vancouver is not a bad city, the true Vancouverites and Canuck fans are not rioters! All of us were just as stunned and disgusted with what we saw as the rest of the world. I am proud of the Canucks for making it to the Stanley Cup Finals and for giving us a great season!!! A while back I made a skirt made from ruffled material, the tutorial can be found on youtube and also here on my blog. 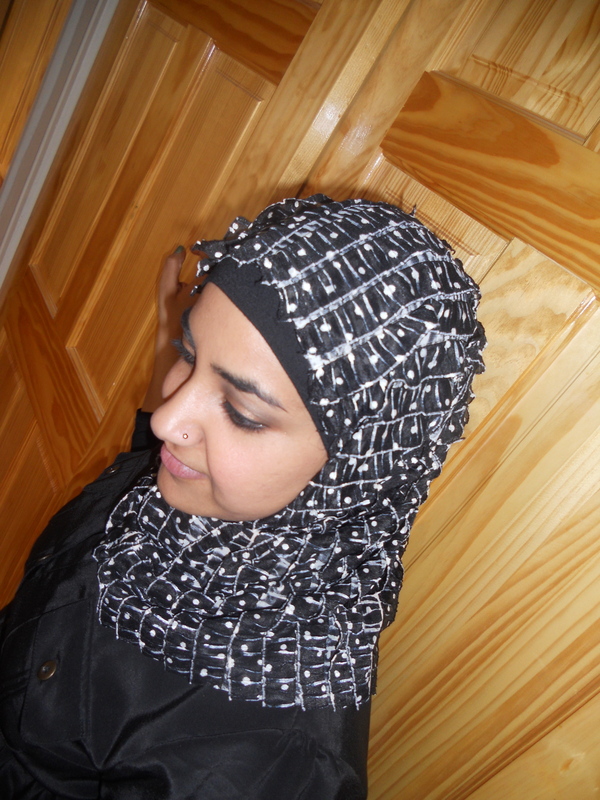 So with the remaining material I was able to make myself a hijab. There are two ways to wearing it, I prefer one over the other, the way I have it in the picture has the ruffles falling down. I don’t really like to wear it that way, I prefer to have the ruffles facing back. I will post a tutorial on how to do wear it the other way this week Insha’Allah. Index Select Category creativity design DIY fashion hijab hijabi islam Just Stuff/updates/randoms Line Production Mercedes Benz Fashion Week muslim Reviews shopping style Uncategorized Vacation BLAH!